Harrison Ford visited the project area in September 2013 as a celebrity ambassador for a US documentary series by Showtime TV addressing climate change called The Years of Living Dangerously. 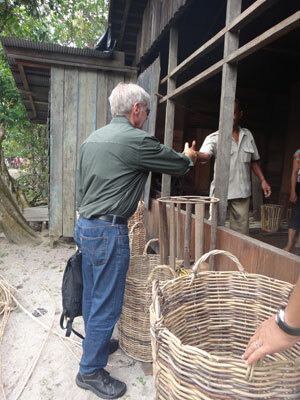 Harrison Ford may be no stranger to cutting his way through jungles, but in September 2013 his trip to the Katingan Project concession in Central Kalimantan, Borneo, was an eye-opener on the potential of peat swamps to mitigate the impacts of global warming while helping local communities. As one of the hosts on the star-studded series Years of Living Dangerously series, which premières on Showtime on April 13, 2014, Harrison Ford travelled to Indonesia to witness the contribution of deforestation to climate change. One of the sites he visited was the Katingan concession, where project CEO Dharsono Hartono and COO Rezal Kusumaatmadja accompanied the film star in the peat swamp to demonstrate how the initiative seeks to reverse the trends in forest loss in Indonesia. Hollywood’s brightest stars and today’s most respected journalists explore the issues of climate change and bring you intimate accounts of triumph and tragedy. YEARS OF LIVING DANGEROUSLY takes you directly to the heart of the matter in this awe-inspiring and cinematic documentary series event from Executive Producers James Cameron, Jerry Weintraub and Arnold Schwarzenegger.